Last weekend we put the baby in a carrier thing that smooshes him against Scott’s chest and makes him (the baby) fall asleep, and we went to a wine tasting. They were doing tiny pours so it should have been a pretty uneventful outing, but I spent last year pregnant and not drinking. After a few thimblefuls of Sancerre I was feeling gooooood. And by the time we got to the Malbecs I was looking deep into Scott’s eyes and going “but, it’s like, what do we want to be when we grow up, you know?” and he was like JESUS, SOMEONE GET THIS WOMAN A CHEESE PLATE WITH EXTRA BREAD. SCOTT: I think he said this one here is elf salami. ME: [opening my eyes wide] WHAT? SCOTT: I knew this place was fancy, but. . . wow. SCOTT: Now I’m starting to worry about how much this cheese and meat plate costs. It went on like this for a while. Names were called and threats were made, and eventually both Scott and the waiter demanded to speak with the manager, who checked with the chef, who determined that the item in question was elk salami. 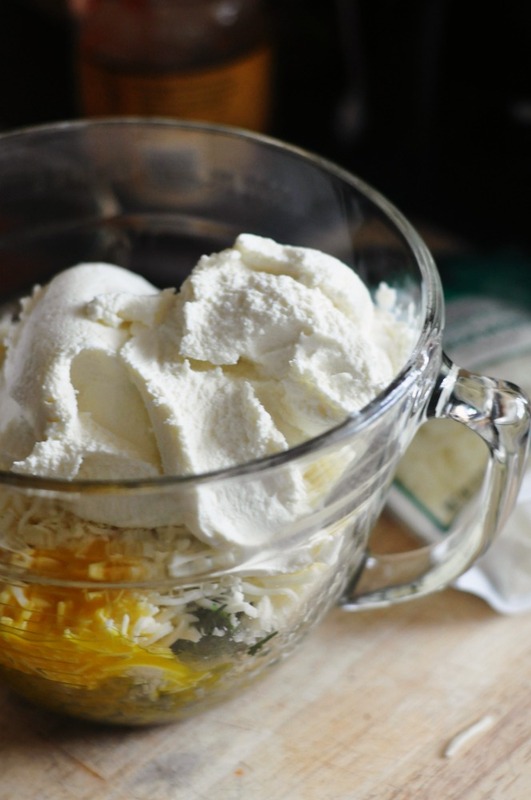 This brings me to today’s recipe, which calls for no meat and only the most basic cheeses. 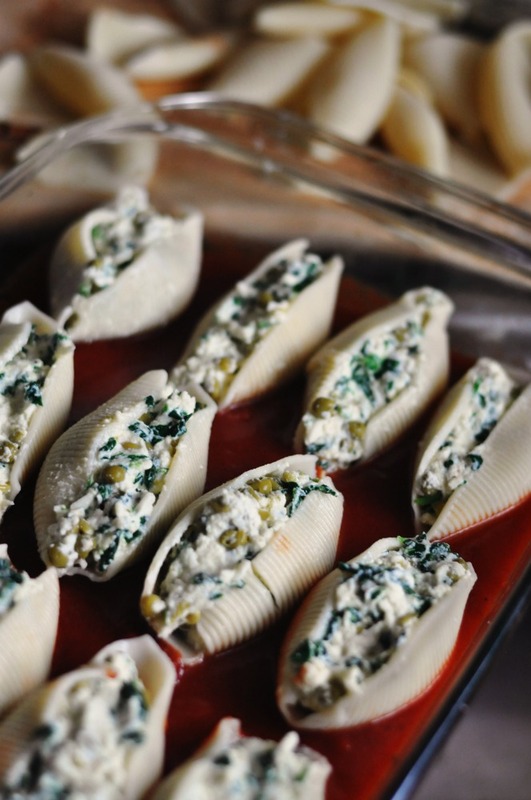 It’s a recipe for stuffed shells based on Lidia Basitanich’s version. I first went to one of Lidia’s restaurants, Becco, fifteen years ago when I waited tables in the Theater District in Manhattan. Her restaurant served heaps of homemade pasta swimming in rich sauces. My restaurant served overcooked scallops and questionable oysters. We were on the same street. Mine was gone within a year, and hers is still doing a hopping business. These shells freeze nicely, and they don’t take long to make if you use store-bought sauce like I do. I also add spinach to the ricotta mixture. I figure I could use the extra nutrients since I’ll be laying off salami for a while. I use a 13″ x 9″ pan and a 9″ x 9″ pan for this. Put a large pot of water up to boil. If you want perfect stuffed shells, boil 30 or more shells, but if you don’t mind that some of them will rip, you only need to boil about 24. (You’ll probably only use about 24 shells, but if you only want perfect shells, you need to boil some extras. For the record, I can’t really tell the difference between a perfect shell and a ripped shell once they’re stuffed and smothered in sauce and baked.) Cook the shells until they’re tender and drain carefully–if you just dump them into a colander, they’ll probably rip. Rinse the shells in the colander under cool water and stuff them soon after they’re drained to prevent them from sticking together. While you’re waiting for the shells to boil, stir together half of the mozzarella, half of the Parmesan, and all of the ricotta, peas and spinach and the egg in a large bowl. 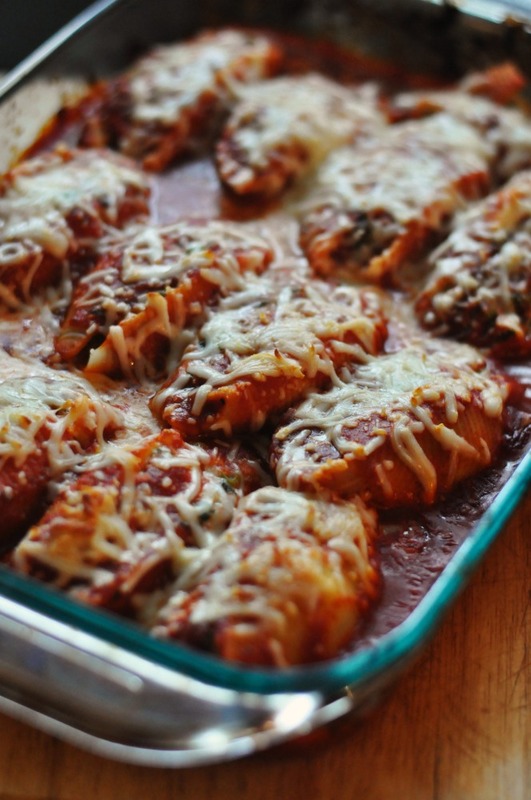 Spread a 1/2″ layer of tomato sauce in the bottoms of the pans. Using your hands or a tablespoon, stuff the shells and lay them in rows. They can be touching, but I typically do 4 across. When you’ve used up all the ricotta mixture, cover the shells in tomato sauce. I usually go through the first jar and have to dip into the second jar for this. You can dribble the sauce on top of the shells and then use a spoon to scoop sauce from the pan and sort of paint the shells with sauce so that they don’t dry out. 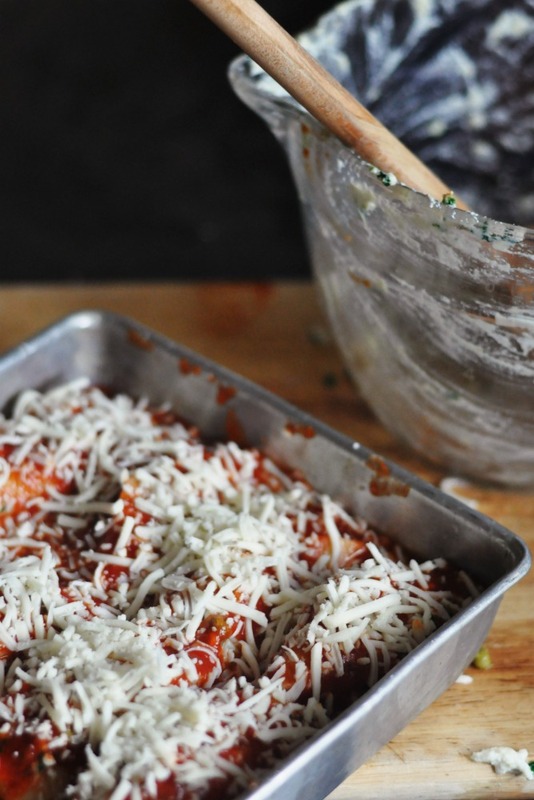 Combine the remaining mozzarella and Parmesan, and sprinkle the mixture on top of the shells. Tent the pans with foil and bake for 25-30 minutes, until bubbly all over, and then remove the foil and bake for another 5 minutes, until the cheese is totally melted and just about to turn golden brown. (Once you remove the foil, the cheese cooks quickly on top, so keep an eye on it.) Serve, or let cool and freeze. 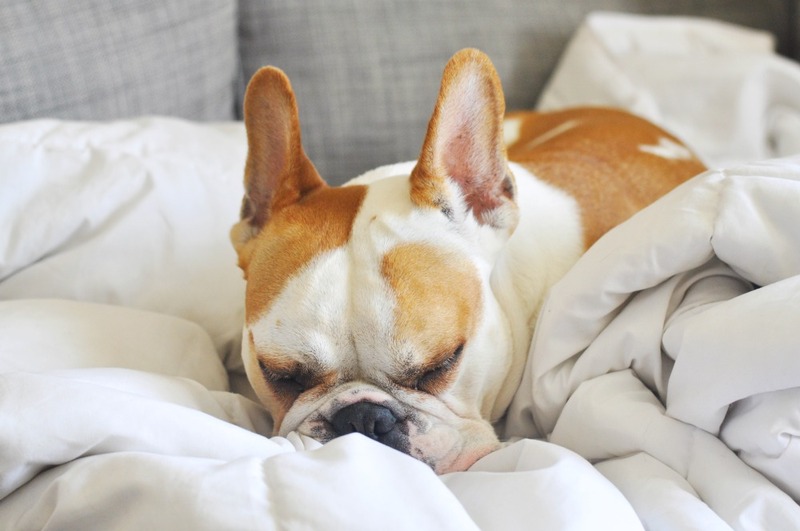 The poor girl is so tired from getting up whenever the baby gets up in the middle of the night that she’s been sleeping through breakfast!